英語: A New View of Society: Or, Essays on the Formation of Human Character, and the Application of the Principle to Practice (London, 1813). Retitled, （英語: A New View of Society: Or, Essays on the Formation of Human Character Preparatory to the Development of a Plan for Gradually Ameliorating the Condition of Mankind, for second edition, 1816. 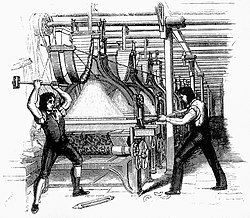 英語: Observations on the Effect of the Manufacturing System. (London, 1815). 英語: Report to the Committee of the Association for the Relief of the Manufacturing and Labouring Poor (1817). ^ Harrison, "Robert Owen's Quest for the New Moral World in America," in （英語: Robert Owen's American Legacy, p. 32. ^ Robert Owen (1818). Two Memorials Behalf of the Working Classes. London: Longman, Hurst, Rees, Orme, and Brown. https://books.google.com/books/about/Two_Memorials_on_Behalf_of_the_Working_C.html?id=sUNBAAAAYAAJ. "Owen, Robert" . Encyclopædia Britannica (in English) (11th ed.). 1911. "Owen, Robert" . New International Encyclopedia. 1905.